It was billed all week long as a playoff dress rehearsal. And all your B.C. Lions (9-8-0) can do now is focus on finishing the regular season strong and being better for the real show. The hometown Saskatchewan Roughriders ( 12-6-0) scored two defensive touchdowns and made life difficult for Travis Lulay and the Lions offence for most of the night in a 35-16 victory on Saturday evening. As a result, the Lions are locked into fourth place in the West and will travel to Hamilton for the East Division Semi-Final on Sunday, November 11. The win for Saskatchewan assures them of their first home playoff game since 2013 when they last won the Grey Cup. They will finish first in the West if the Lions defeat Calgary next Saturday at BC Place. As for this loss, the players in the visiting locker room admitted they simply must be better. “We were starting from inside our own 20-yard line for the majority of the game and defensively we started at midfield. When that happens, it’s a recipe for disaster, ” said running back Tyrell Sutton who finished with 50 yards on 12 carries. The home side took a 13-0 lead on Tre Mason’s second quarter touchdown run. After that play, Riders starting quarterback went through concussion protocol as the result of a hard hit from Odell Willis. Their offence didn’t skip a beat with Brandon Bridge behind centre and finished with 199 rushing yards. “We just were out of sync,” explained head coach Wally Buono. They did get some life to start the second half when a Dyshawn Davis fumble recovery on the opening kickoff led to Lulay’s touchdown strike to the always-reliable Bryan Burnham. That got them to within seven points with nearly an entire half to play, but they could not build on that much-needed momentum swing. The real backbreaker came on a Zack Evans strip sack that resulted in a touchdown and a 25-9 lead heading to the fourth quarter. Lulay was pulled in favour of Jonathon Jennings after Ed Gainey’s interception return for a major. “That’s their recipe for the success and they executed their game plan,” said Lulay of the Saskatchewan defence. They knew they were coming into a buzzsaw and would have to establish some early momentum to take the rowdy Regina crowd out of it. At the end of the day, this was a defence that never let up for 60 minutes. “You’ve got to give Saskatchewan and their defence a lot of credit,” explained Buono. And yes, we’ve seen this movie before but all you can do is learn from it and try your best to use it as motivation for when these games become ‘do or die’ in two weeks time. Despite playing nearly three full quarters, Bridge finished with just 54 passing yards on four completions. That just speaks to how well they did in the ground game. 94- Lulay’s passing yards on just nine completions. 214- Total yards for the Lions offence. 199- The Riders’ total rushing yards, 134 coming from Cameron Marshall. 4- the number of times Saskatchewan punted in this game. 2-7- The Lions regular season road record in 2018. They will have to match that total if they want to represent the East in the Grey Cup. 12-6- The Riders regular season record, the first time they’ve hit that win total since 2008. The Lions wrap up their regular season at home to the Calgary Stampeders (12-5-0) on Saturday, November 3rd on Wally Buono tribute night. The first 5,000 fans will receive a limited edition bobblehead. It is a 7 p.m. kickoff. 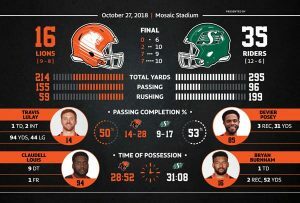 ROAR REPORT: Lions clinch playoff berth with win over Edmonton!